Between the move on the first weekend of June and a conference on the second, this month is just flying past. Suddenly there are only three weeks to go in Madison, and then I’m off to Chicago. It’s craziness, I tell you. Since the weeks are slipping so quickly past, I am suddenly facing a rather tight deadline on a weaving project that I’d like to get done for a friend before I go. I’m not big on deadline crafting, and I’m even less inclined to secret projects, but if I show you the yarn she’ll know who it’s for. So I’m sorry, but you’ll have to wait until later for full details. Fortunately, “later” really won’t be very long in this case (I hope). I think I should be able to finish them tonight, if I push hard. Since I can’t show you what I’ll be putting on the loom next, I thought I might show you some recent acquisitions from a foray to the LYS on Sunday. 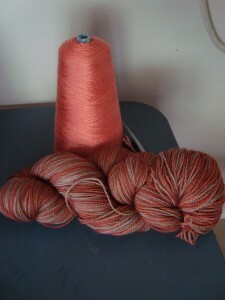 Perhaps it’s ironic considering the subject of my last post, but both purchases are for weaving this time. They’re shown below with their partner cones from the stash. So there you have it. I had enough yarn before, and now I have enough plus three skeins. Yeah, that time thing! 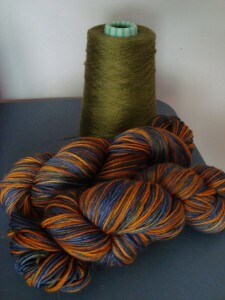 The yarns are lovely, though, and when you know you’ll use them…ok, so I’m really good at yarn-related justifications. 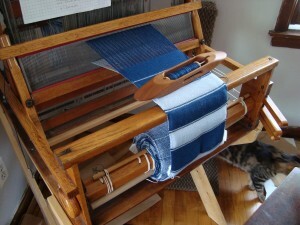 Good luck with all the weaving! The yarns go so nicely with those cones, I think it is possible you didn’t have enough yarn before. But you are right – the real problem is not enough time! Time! Honestly, if my LYS could sell time, she’d make a killing, because that’s really what I need to get through all of the projects that are in my mind. I love the yarn choices you made – I can’t wait to see what they become! DesigKnit is powered by	WordPress 4.8.9 . Page generated in 0.405 seconds using 36 queries.